Crazy-looking keyboards that never caught on. And how they could lead us to a better typing future. Replica of 1835 Cooke and Wheatstone Five-Needle Telegraph. No matter what device you are using to read this article, it is almost certainly both many times smaller and many times more powerful than the machines that decoded the Enigma or powered the moon landings. This is Moore’s law in action: For the last several decades, we have all benefited immensely from the way our computers have shrunk in size even as they have expanded in capability. And yet we ourselves have not changed: Our fingers are just about the same size, and our eyes are just about as sharp. The result is computers that are increasingly nothing but screen, as available as possible to our touch and our vision. But these shiny new tablets are unthinkingly replicating some rather creaky technologies, notably the typewriter keyboard, which pops up, QWERTY and all, on even the sleekest new Apple gadgets. Why are we still so attached to the keyboard, when touchscreens could allow us to reinvent the way we type? It may be that technologists expect Siri’s siren song to lure us along a path to a speech-powered world, but voice recognition has been the next big thing for a long time now, but most of us still spend our waking hours prodding away at keyboards: texting, writing emails, and chatting in type to friends and tech-support reps alike. And yet the biggest difference between digital keyboards and the mechanical ones they’re modeled after are the emoji. Is there a smarter, more efficient way for us to input text? A look at the lost keyboards of the past—the greatest keyboards that never caught on—might help us find a better way to type. It was the electric telegraph, which allowed for the transmission of writing at a distance, that first paved the way for the keyboard. Since Gutenberg, the act of printing letters had been a very material process: Each style, weight, slant, and size of letter requires a separate metal slug, which were kept in trays called typecases (an amazing number of variations of which are collected here). But when the telegraph was invented, letters had to become abstract pulses in order to make it through the wires, so while telegraph devices might be considered the first keyboards, they are barely recognizable to us as such. The Wheatstone and Cooke board used a complicated system of five needles and a diamond board of 20 letters (too bad for you, C, J, Q, U, X, and Z! ), while the single Morse key sent all symbols, and the length of the operator’s taps determined the message, from one dot for e up to five dashes for zero. Morse’s dominant telegraph system required highly trained operators who could translate language into keyed patterns and, on the other end, back into language. After telegraphy was standardized, a number of different systems were devised to dispense with this need and, therefore, with the extra cost of the operators: The prolific Charles Wheatstone patented an ABC Communicator into which an untrained operator could punch a message, as well as the automatic telegraph, which used paper tape, pre-punched with Morse code, in order to send messages much faster than a human operator could manage. 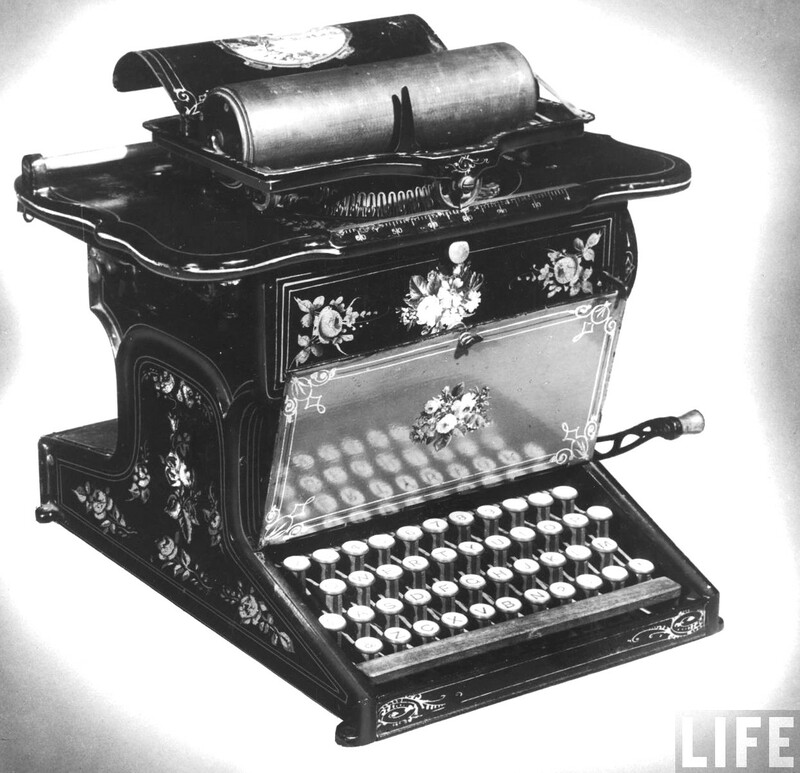 Prototype typewriter invented by Christopher Latham Sholes, Carlos Glidden and Samuel W. Soule between 1868 and 1873. Photo by George Iles/Wikimedia Commons. As the typewriter become popular, it was sometimes referred to it as a “literary piano,” or “the sewing machine of thought.” But the piano and the sewing machine both require a more complex interaction between fingers and machine parts than does the keyboard, which essentially requires you to press whatever button features the letter or symbol you’d like to type. But there is a more complicated sort of keyboard, called a chorded keyboard, that allows for much speedier typing. As interaction designer Bill Buxton has put it, you can think in terms of two extremes: a keyboard with one key for each possible symbol (like the Remington No. 1), or one key that does all symbols (like the Morse key). Today, a standard keyboard is close to one key per symbol, although the shift key (as well as alt, control, command, and so on) complicate the situation. A chorded keyboard takes this principle to the extreme, requiring users to press multiple keys at once. Like playing piano or guitar, typing on a chorded keyboard takes practice. For manufacturers, it makes sense to design keyboards that the biggest number of people can use with the least possible training. But as computers shrink to pocket size, keyboards shrink as well, and the dynamic touchscreen starts to replace the static key as the default point of interaction between hand and object. Put the two together and you get something dinky, slippery, and difficult to use. But you also have the potential for change, and the principles of the chorded keyboard—which has a kind of parallel history to the standard keyboard—might offer a useful model for the future. As Tom Standage writes in The Victorian Internet, in 1874—around the same time that the typewriter was taking off—a French telegraph administrator named Jean Maurice Emile Baudot was devising an alternate system for sending Morse code. Rather than allowing a single operator access to the (very expensive) telegraph wire in order to key in one letter at a time, Baudot devised a rotator that swapped among different operators at regular intervals of less than a second, during which the operator would send a single letter or symbol. But the swapping needed to take place at regular intervals, and in standard Morse code, each letter takes a different amount of time to transmit (individual operators also tap in individual rhythms, part of what Morse aficionados use to identify the “fist” of a particular operator). So Baudot invented a code in which five pulses, each of which could be on or off, could be translated into a letter. The operators, sitting at a piano-like keyboard with five keys, would indicate which pulses were positive by holding down the corresponding keys with three fingers of one hand and two of the other. To transmit A, the operator would hold down only the last two keys, creating the code 00011. For B, they would hold down the first two keys and the last: 11001. The code would transmit at designated intervals, which meant that, unlike a Morse code operator who steadily transmitted a personally rhythmic stream of information, the operator of a Baudot system would wait for his slot, then key in a digit when prompted by a clicking noise. (These intervals were eventually standardized and given the name baud in honor of Baudot. Remember waiting forever for things to download on a 2,400-baud modem? They are capable of sending 2,400 symbols a second, some 160 times faster than five highly trained Baudot operators, all sending together on one line, could manage.) Baudot’s code developed the principle that eventually became the basis for ASCII, or the American Standard Code for Information Interchange, which is the way in which nearly every computer and phone now represents text. Another use for the chorded keyboard arose around the same period: recording speech, which in English occurs at a rough average of 180 words per minute. (Typing on a regular keyboard can get you up to about 120 WPM, but for most of us it’s about 30-50 WPM). Stenotype machines became widespread in the 1910s. The American stenotype machine has 22 keys, not all of which represent different letters (the S and T, for instance, each appear twice). To record language, a stenographer must think in phonemes (the basic units of language, phonemes in languages like English are frequently, but not always, represented by a single letter: “h” as in “how” is a phoneme, but so is “sh” as in “crash”). “Stroking” is the act of pressing either individual keys or combinations of keys on a stenotype in order to record sounds, words, or even phrases. In general, the thumb usually hits the vowel keys and the fingers hit consonants. The system is sometimes phonetic—the word “enter” is entered by hitting the T with the left hand, the E with the thumb, and the R with the right hand—but frequently it just seems nonsensical to the untrained: The M sound is produced by hitting the P and H keys with the left hand if it occurs at the beginning of a word, and the P and L keys with the right hand if it occurs at the end. (A good demonstration of this can be found here.) The record for a stenographer is 260 WPM, but the translation of words into key-presses and then back into words is idiosyncratic, and so the cryptic curtain of letters produced by a stenotype machine has to be transcribed by a person, or by an expensive computerized stenotype, which internally translates the notations into plain language, using a personalized dictionary for each stenographer’s abbreviations. Similar to the stenotype is the veyboard, which was originally developed in the Netherlands as an alternative stenotype keyboard called the tachotype, in 1933. A computerized version called the velotype was developed around 1982, as a stand-alone word processor; in 2001 it was reworked as an alternative keyboard that can function, in conjunction with software, on a modern computer. It has a wing-like layout, and looks a little like a stenography keyboard, with the vowels in the middle and the consonants to the sides. As on a stenography keyboard, the user types from left to right, but language is entered in syllables instead of phonemes. Each syllable is entered by pressing multiple keys at once. For instance, to type the word “patter,” you would type “pat” and then “ter,” by hitting P with your left hand, A with your thumb, and T with your right hand, all at the same time, and then, again all at the same time, T with your left hand, E with your thumb, and R with your right hand. As with the stenotype, some letters are on the keyboard, but others must be produced by hitting two keys at the same time. A typist can go much faster on a veyboard than on a standard keyboard and still produce normal text output, unlike the stenotype. However, it takes weeks to become proficient, and the veyboard itself is quite expensive, meaning that it is primarily used for specialized purposes like deaf interpretation and television subtitling. The electronic Velotype as produced in 1985. A different kind of chorded keyboard was present at one of the computer industry’s legendary moments, in 1968, when Douglas Engelbart of the Stanford Research Institute gave a 90-minute demonstration (the “Mother of All Demos”), which debuted, among many other things, the mouse and the idea of hypertext. Engelbart used a piano-key-like five-key keyboard as a complement to a keyboard and a mouse, with the idea that a user could manipulate the chorded keyboard and the mouse at the same time as an alternative to constantly switching between the regular keyboard and the mouse. Other chorded keyboards were also aimed at one-handed typing, sometimes for the sake of portability, like the 1978 Microwriter, a digital word processor with six keys (two for the thumb), arranged so a typist could input words while carrying the device. Chorded devices like this, which do away with the keyboard altogether, are called keyers. In ETCetera, the Journal of the Early Typewriter’s Collector’s Association, Jos Legrand has written about an amazingly early iteration of the keyer: Livermore’s Permutation Typograph or Pocket Printing Machine. Benjamin Livermore, a Vermont inventor in the 1850s, created this word processor, which printed onto a long strip of paper. Livermore apparently carried his machine around in his pocket, secretly typing away, and kept it under his pillow at night to “catch any stray thoughts.” Livermore’s prescient machine, like the Microwriter, could be used without the user even looking at it, but both also have the evident disadvantage that in order to type with it you have to memorize the chords; there is no way to hunt your letters down before you peck them out. A Microwriter MW4 hand-held word-processor circa 1980. Photo by Steve Baker/Wikimedia Commons. In fact, all mechanical chorded keyboards have that disadvantage, and none of them has caught on widely. One of the big arguments against chorded keyboards is how much training it takes to use them. But one of the most popular forms of entertainment—video games—are essentially training programs for increasingly complex interactions between our hands and our computers. These days, kids who probably tried to swipe at their first touchscreens from inside the womb are learning from FIFA, not Mavis Beacon. And while the goal of making computing available for the untrained isn’t a bad one, the tiny, glassy keyboards we use so often now don’t work for older people with arthritis or bad eyesight. Chorded keyboards and keyers also have a number of advantages, especially in a world where everyone who’s driving or walking down the street seems also to be texting. You can input information much more quickly. With some setups, you can type without looking at the keyboard, or you can type with one hand. You need many fewer keys. And when the keyboard loses its material quality and becomes a picture under glass, it means the placement, size, and symbol of the key can change as you use it. There are a few new attempts to combine the ideas of a chorded keyboard with the advantages of the contemporary interfaces. The FrogPad is a chorded keyboard that you can use with one hand. Other applications, like the open-source GKOS and Teague Labs’ keyboard also allow you to type chords with a hunt-and-peck approach, by changing the screen to show which letters are available with each key press. These are tentative experiments, but the idea of combining a chorded keyboard and a touchscreen seems like a great way to take advantage of the fluid nature of both. None of these systems is ideal. But given the current alternatives of terrible autocorrect blunders, keys the size of pinheads, and voice-recognizing systems that never seem to work, a new “sewing machine of thought” must be just around the corner, and the chorded keyboard might be one way to get there. Sara Goldsmith is a senior editor at Laurence King Publishing in London.